On December 28, 2015 at approximately 1:15 pm Officers of the Garden City Police Department and Finney County EMS were dispatched to 708 N Main (Prick the Skin Body Piercing and Tattoos) reference a 51 year old male unresponsive and not breathing. When Officers arrived on scene they located the man deceased in the rear part of the business with what appeared to be a gunshot wound. Search warrants were obtained for the business and residence. Evidence was located and collected at the scene and a forensic autopsy was conducted. No foul play is suspected. This is an ongoing investigation; no further information will be released. 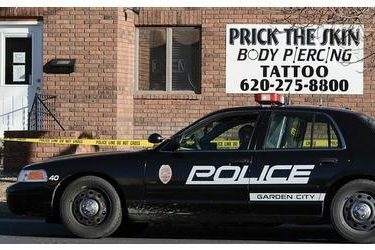 On Monday afternoon, the Garden City Police Department was investigating a dead body reported at Prick the Skin Body Piercing and Tattoo, 708 N. Main St. According to reports, the victim has been identified as Daniel Arthur McClure. Crime scene tape and police vehicles were on scene most of the afternoon. When contacted, Garden City Police Sgt. Andrew Roush said officers were investigating the death, and declined to say whether foul play was suspected. At this time, police do not know what happened, according to Roush, who added that they planned to issue a news release Tuesday morning. On Monday afternoon two police officers in a patrol car were stationed outside the tattoo shop where crime scene tape surrounded the front of the building. Prick the Skin opened May 1, 2012, by Justin Wenrich and Jason Greenfield. The shop is home to Liquid Inferno, a tattoo business run by Greenfield, according to the 2012 story. The two met in 1997 when Wenrich, a former engineer of 14 years, was working in Frontenac and decided to get a tattoo on his birthday.